Thinking outside the square seemed to be a defining feature of the Convict mind. Such thinking was clearly on display when a Convict tried to escape Port Arthur by disguising himself as a kangaroo. In hindsight, it wasn't a clever idea as the guards saw the kangaroo and used it as target practice. Novel thinking was also on display when catholic Convicts worked out a form of suicide that would not only get them around god's laws, but would also win their mates a holiday in the big smoke. While being transported to Australia in 1843, a Convict secretly stowed himself away in the hold of the Maitland. He had planned to arrive in Sydney unsuspected and then assume the role of a free settler. Having been missed, it was presumed he had just fallen over board and drowned. Six weeks after his disappearance, the captain suspected his champagne stores had been tampered with. During a search to ascertain whether there was a hidden entrance to the stores, the lost Convict was discovered. Later, the man was transported to Tasmania and again he made a dash for freedom. He was last seen paddling across the ocean in a stolen washing tub. To escape from Port Arthur, Convicts had to pass across a narrow isthmus known as the Neck. This was guarded heavily by ferocious dogs and surveyed by stationed military personnel. A Convict named Billy Hunt disguised himself as a kangaroo in the hope making it through the Neck. The plan was working brilliantly until one of troopers decided to use the kangaroo as target practice. Billy was then forced to reveal his true identity. A group of Convicts got the idea that China was across some river just north of Sydney. Comforted by this knowledge, 20 male Convicts and a pregnant female set off on foot to build a new life in China. One died of exhaustion, four were speared by Aborigines and the remainders stumbled back into Sydney a week later. Life in Coal river (Newcastle) and Macquarie Harbour (Tasmania) was hell on earth and many Convicts felt that death was their only hope of escape. Unfortunately, many of the Irish Convicts were catholic and feared that suicide (an unforgivable sin) would send them to an eternal hell. To solve this dilemma, they devised a plan based on teamwork. Four Convicts would draw straws; one to be murdered, one to be the murderer and two to act as witnesses at the murder trial so as to ensure a conviction. The plan was win win all round. The victim would escape life without fear of going to hell. The murderer would be executed and also escape life. As for the witnesses, they would have to testify at a trial in either Sydney or Hobart and thus have a holiday. In October 1861, Frederick Ward was arrested for horse theft and imprisoned on Cockatoo Island. The Island was said to be impossible to escape from as the men were chained and the harbour was inhabited by man eating sharks! 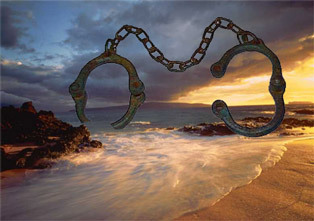 Despite the danger, Ward's girlfriend, Mary-Anne Bugg, swam to the island with a file for Ward to cut through his chains. After freeing himself, Ward swam to Balmain and with Mary, moved to the Hunter Valley. Daniel Gordon was a Convict of African heritage. In February 1788 he was tried for robbing the public store and condemned to death. He was later pardoned on the King's birthday in June. In August 1789, he was again caught stealing and was expected to be sentenced to death. However, as he appeared 'wild and incoherent' in court, his trial was postponed until the following day. When his condition failed to improve, the judge placed him in the care of surgeons as unfit for trial. It is hard to know whether judge believed Daniel was insane or was just entertained by Daniel's colourful antics. As for Daniel's fellow Convicts, they were in no doubt. It was said that they " gave him credit for the ability he had acted his part and perhaps he deserved their applause. "Daniel died 39 years later, aged 81. Mary Bryant escaped in the Governor's six oar cutter with her husband, baby son, three year old daughter and five other Convicts. They then rowed to Timor, (5000 Kilometres from Sydney) navigating the uncharted Great Barrier Reef and the Torres Strait. Upon arrival in Timor, they claimed to be ship wreck victims but were soon identified as Convicts and sent back to England for trial. On the return journey, Mary's husband and son died of fever. Sadly for Australia, the English press found her tale of perseverance quite stirring and so rather than transport her once more, she was freed into the community where she no doubt strengthened the gene pool that had been weakened by the loss of Convicts. A Eora warrior named Pemulwuy was felled with seven bullets and taken to a Parramatta hospital. He lapsed in and out of consciousness for many days and his death was thought to be a certainty. Amazingly, Pemulwuy recovered and several weeks later, he somehow escaped into the darkness; his leg-irons still in place. According to the Eora people, his impossible escape was achieved by turning himself into a bird. Alexander Pearce was transported to Sarah Island in 1822. A month later, he escaped with Thomas Bodenham, Robert Greenhill, Matthew Travis and John Mather. The party headed overland to Hobart. After 15 days without food, they decided to experiment with cannibalism. The men drew straws and it was Thomas Bodenham who drew the short one. He knelt down, was killed by a blow to the head and subsequently served up for lunch. A week later, John Mather was foraging for roots when a hungry Greenhill crept up behind him, and swung at him with an axe. At that very moment, Mather moved and the axe glanced off his head. The two men wrestled and Mather seized control. However his good fortune didn't last long. Determined to eat him, the other three ganged up and killed him. Four days later, Travis was bitten by a snake. Six days later, he too was on the menu. This left only Pearce and Greenhill. For a few days, each eyed the other suspiciously but vowed not to betray the other. Pearce thought Greenhill was lying and so killed him in the dead of night. Out of character for Pearce, he left the body untouched. In 1823, Pearce was recaptured and confessed to his crimes. Such was the fanciful nature of his story, no one believed him and so he was sent back to Sarah Island. Nine months later, he again escaped and for provisions, he took with him Thomas Cox. A few weeks after escaping, a crew of a passing ship saw smoke and Pearce was found. He again confessed to his crimes and even had a morsel of Cox to verify his story. Pearce was taken back to Hobart and hanged on the 19th July 1824. The judge at his trial declaring that the case was 'too inhuman to comment on'. A group of Convicts stole the Cyprus, a supply vessel carrying a group of Convicts to Macquarie Harbour. They dumped the officers and crew on shore and sailed off to Japan where they pretended to be shipwrecked British mariners. They were sent back to Britain as shipwrecked sailors. Unfortunately one of them was strolling through London town when he met an ex-police constable from Hobart town who recognised his tattoos. William Buckley escaped from the Sorrento settlement in 1803. The settlement was then disbanded and with nothing heard of Buckley, it was presumed that he had starved to death or been killed by Aborigines. 33 year later, a farmer came upon a strange white man speaking an aboriginal language. He had a extremely long beard and wore possum skins. Once the man learnt to speak English again, he informed the authorities that he was William Buckley and had spent 33 years living with the Aborigines. He was pardoned and became a respected civil servant. His story inspired the saying 'Buckley's Chance'. John O'Reilly wanted to annoy the English and so he hatched a plan to rescue Irish Convicts from Western Australia. For his plan, he organised for an American boat, the Catalpa, to sail to Western Australia to rescue Convicts. On March 29, 1876 the Catalpa arrived off Western Australia. Six Irish Convicts made a dash for freedom by running into the bush where they were picked up in wagons, rode to the whaleboats and then on to the ship. A number of people witnessed the escape and reported it to the authorities. However such is the nature of grapevine communication, by the time word reached Perth, the story was not Convicts escaping, but the Irish invading. Western Australia went into war mood. Troopers were dispatched to dig trenches and the gunboat Georgette steamed out to sea to courageously confront the invading Irish fleet. But the only ship found was the Catalpa. Numerous shots were fired across its bow which brought every Irishman onto the deck. There, armed with everything from a whaling lance to meat knife, they started chanting "death, but no surrender." The Geogettes's captain demanded to know if any Convicts were on board. The Catalpa's captain said no and that as an American ship outside territorial waters, he would not submit to a search. The Geogette then turned back to port while the Catalpa continued on its way to America. When it eventually arrived, O'Rielly took to the public speaking circuit where he gave a popular lecture on how he had made the English look like buffoons. After the official closure of the penal settlement on Sarah Island, twelve Convicts, under the supervision of several soldiers and Master Shipwright David Hoy, remained behind to complete the fitting out of the brig, Frederick. Although the specific orders concerning the fit-out had been mysteriously mislaid, the men dutifully carried out their tasks with 'great propriety, executing Mr. Hoys' orders with promptitude and alacrity'. The Frederick was launched in January 1834 and ten of the Convicts celebrated the occasion by seizing control. They sailed it to New Zealand and then onto South America. It was abandoned off coast of Chile and the Convicts rowed the ship's whaleboat the remaining 80 km to shore. Passing themselves off as shipwrecked sailors, they assumed positions as shipwrights and became respected members of the community. Several married local women, while six of the men made a further escape to America and Jamaica. The four who remained in Chile were eventually caught and brought back to Hobart for trial as pirates. As the boat was seized from the harbour rather than the high seas, they escaped the charge but had to live out their days on Norfolk Island.